California State Route 905 follows the Otay Mesa Freeway east across southern San Diego from Tocayo Avenue and Interstate 5 in the San Ysidro area to the International Border at Otay Mesa. A major commercial route, SR 905 is the main gateway for trucks into Mexico, as trucks are prohibited at the San Ysidro Port of Entry connecting with I-5/805. Despite completion of the freeway from I-5 to the Otay Mesa port of entry on July 30, 2012, the Otay Mesa Freeway remains a state route. 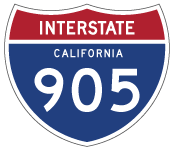 Per an agreement between Caltrans and the Federal Highway Administration (FHWA), it is expected that SR 905 will be upgraded to Interstate 905 in the future. The Interstate designated was pre-approved by the American Association of State Highway and Transportation Officials (AASHTO) on December 7, 1984. California State Route 905 is part of High Priority Corridor 30: Camino Real for its entire length. Otay Mesa was expanded to six lanes by 2000 with $20 million in state and local funds.1 The first section of SR 905 upgraded to freeway standards east of San Ysidro was the interchange with Siempre Viva Road (Exit 9). This exchange was completed in 2005. Upgrades for the remainder of SR 905 were originally slated for 2006 or 2007, but funding constraints partitioned construction into four separate projects. A westerly extension of SR 905 through Border Field State Park and the Tia Juana River Valley was proposed legislatively. However, the extension remains unconstructed due to environmental concerns. Construction of the parclo A2 interchange joining La Media Road with SR 905 (Otay Mesa Freeway). Photo taken 07/12/09. Some of the first reflectorized signs installed along Interstate 5 in San Diego prematurely referenced SR 905 as Interstate 905. These were quickly amended in the ensuing weeks. Photos taken 09/01/03. California 905 was upgraded to freeway standards from the port of entry to the parclo interchange (Exit 9) with Siempre Viva Road in Fall 2005. Siempre Viva Road connects the state route with the commercial port of entry to the east and a number of warehouses and shipping facilities. Photo taken 07/12/09. 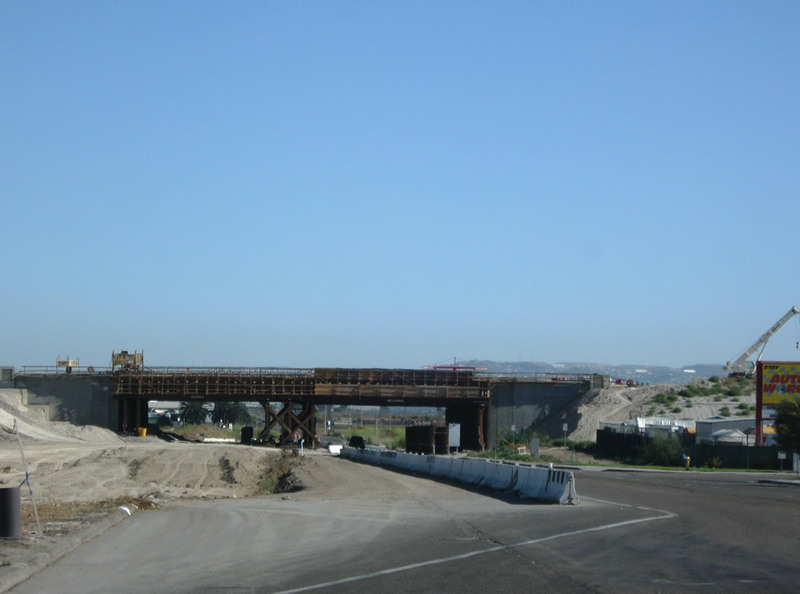 Beyond the Siempre Viva Road overpass, all traffic defaults to the Otay Mesa Port of Entry into Tijuana, Mexico. Photo taken 07/12/09. A U-turn provides return access to SR 905 (Otay Mesa Freeway) westbound just ahead of the port of entry. Continuing south into Mexico is the Otay Mesa section of Tijuana, located just east of Tijuana International Airport (TIJ). Photo taken 07/12/09. California 905 leaves the Otay Mesa port of entry and quickly enters the parclo interchange (Exit 9) with Siempre Viva Road. Completed in Fall 2005, this exchange replaced an at-grade intersection. Photo taken 07/12/09. A welcome to California sign stands beyond the gore point for Siempre Viva Road. Photo taken 07/12/09. Eastbound California 905 begins at the intersection of Tocayo Avenue and Oro Vista Road, just west of Interstate 5. Photo taken 07/12/09. California 905 enters a cloverstack interchange with Interstate 5 to the immediate east of Oro Vista Road. Photo taken 08/21/04. A loop ramp follows for Interstate 5 north to Chula Vista, National City and Downtown San Diego. Button copy signs here predate the upgrade of Otay Mesa Road to a freeway. Photo taken 08/21/04. Dense residential development lines both sides of SR 905 (Otay Mesa Freeway) leading west from I-805 to Interstate 5. The final interchange joins the freeway with Beyer Road, the historic alignment of U.S. 101 south into San Ysidro. Photo taken 07/12/09. 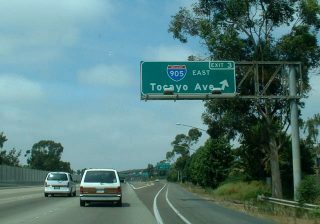 The entrance ramp from Beyer Boulevard forms an auxiliary lane for I-5 south to Tijuana and the west end of SR 905 at Orlo Vista Road. Photo taken 07/12/09. The westbound SR 905 mainline defaults onto Interstate 5 north toward Chula Vista, National City and Downtown San Diego. Photo taken 07/12/09. A loop ramp (Exit 1B) connects SR 905 west with Interstate 5 south to San Ysidro and the international border. Photo taken 07/12/09. SR 905 concludes a third of a mile beyond Exit 1B at Tocayo Avenue and Oro Vista Road. Photo taken 07/12/09. An end shield stands at the signalized intersection with Tocayo Avenue west and Oro Vista Road. Oro Vista Road connects the freeway end with subdivisions to the south and duplexes to the north. Tocayo Avenue extends west to Hollister Street and an adjacent neighborhood. Photo taken 07/12/09. Interstate 5 converges with SR 905 a half mile northwest of the parclo interchange (Exit 2) with San Ysidro Boulevard. 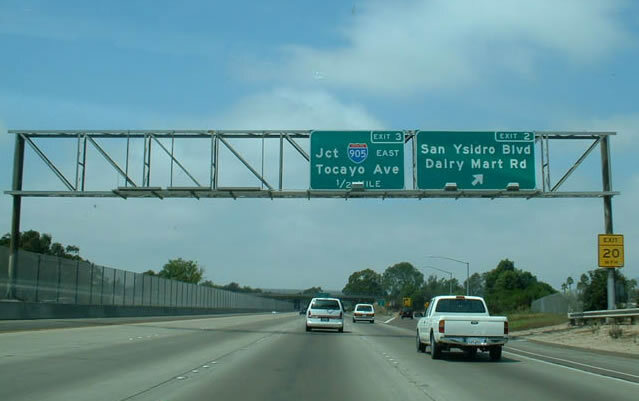 Dairy Mart Road travels north from Exit 2 to Beyer Boulevard at an exchange with SR 905 (Otay Mesa Freeway). Photo taken 07/18/04. A collector distributor roadway (Exit 3) partitions from Interstate 5 north for California 905 (Otay Mesa Freeway) east and Tocayo Avenue west. Photo taken 07/18/04. Exit 3 splits for California 905 east to Brown Field Municipal Airport (SDM) and Otay Mesa and a loop ramp for the west freeway end at Orlo Vista Road.. Photo taken 07/18/04. Interstate 5 advances 0.75 miles south from Coronado Avenue to the cloverstack interchange (Exit 4) with the Otay Mesa Freeway. Photo taken 08/21/04. Southbound Interstate 5 expands to five lanes gains ahead of Exit 3 for SR 905 east and Tocayo Avenue west. The fence separating traffic along the southernmost section of I-5 is designed to keep pedestrians from crossing the freeway. Photo taken 05/22/04. Two lanes separate from Interstate 5 south at Exit 3. SR 905 leads east to the Otay Mesa Port of Entry via the Otay Mesa community and Brown Field Municipal Airport (SDM). Tocayo Avenue leads west from SR 905 into San Ysidro. Photo taken 05/22/04. A high flyover carries traffic onto California 905 east. The state route meets Interstate 805 in two miles. Photo taken 05/22/04. The original button copy signs for the interchange joining I-5 with California 905 east and Tocayo Avenue. Photo taken 06/10/00. SR 905 Fact Sheet (SANDAG). July 2012. “New roads between border, South Bay Highways, completed.” The San Diego Union-Tribune (CA), November 30, 2016.